If you are a casual youtube movie maker that like to upload some your personal video to YouTube for sharing? 4K video is getting hotter and hotter. Are you interested in recording some personal 4K footage to YouTube uploading? Maybe you also can edit your 4K footage to make it more fantastic and shinier. Anyway, if you plan to get popular in YouTube with your production, a combination of iMovie and DJI Mavic Pro will surprise you with which you can post some personal brilliant 4K video to YouTube by editing DJI Mavic Pro 4K video on iMovie. DJI Mavic Pro from DJI is possibly the best consumer model 4K UHD-capable quadracopter. It’s very small size may give an impression of weak performance but this is deeply deceptive. Quite the contrary is the case, the Mavic is superbly designed, offers great performance and in many ways outdoes most competitor drones that have come out at around the same time. 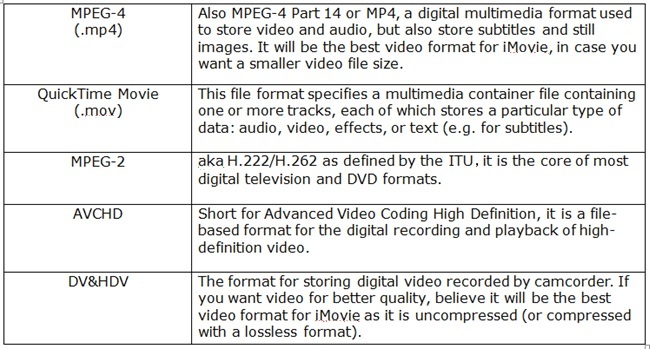 iMovie supported import formats: MPEG-4 (*.mp4), QuickTime Movie (*.mov), MPEG-2, AVCHD, DV& HDV. You can check the details in the following sheet. iMovie lets you edit and share 4K video captured from DJI Mavic Pro. After you've recorded 4K video, simply add 4K video clips to your project in iMovie for Mac.You can combine 4K video with other types of video clips and photos in the same project in iMovie. 1. With a movie or trailer selected in the Projects view or opened in the timeline, click the Share button. 2. Select File as the destination. 3. Next to Resolution, choose 4K. 4. Click Next, then save your movie. You can also share your DJI Mavic Pro 4K movie directly from iMovie to YouTube. When sharing to other online destinations, your movie might be converted to a lower resolution with some 4K Compressor. On iMac with Retina 5K display, iMovie 10.1 allows you to view pixel-for-pixel 4K video while editing your movie. First, put iMovie into full screen mode by clicking the green button in the upper-left corner of the window. Then drag the lower edge of the Viewer to expand it to its maximum size, which shows 4K video at 100% resolution. Note: 4K editing and sharing with iMovie for Mac is supported on Mac computers from 2011 or later with at least 4GB of memory.Generally the common personal computer doesn’t have the ability to process the DJI Mavic Pro 4K video editing work, even if you can import DJI Mavic Pro 4K footage into iMovie on Mac. The quality of DJI Mavic Pro 4K videos is ultra high definition, so it requires very powerful computer hardware for smoothly editing. In short, for the purpose of better and smoother editing, you're advised to compress DJI Mavic Pro 4K to 1080p for iMovie for Mac with HD Video Converter. What's more, DJI Mavic Pro 4k video can't be imported into iMovie for the frame rate issue. A HD Video Converter also can help you remove the issue. The H.264 codec is not good for video editing. Even with high computer Configuration with a hard disk array, you will encounter performance issues if your source 4K video is in H.264 codec. AIC is the most compatible format for iMovie. On Mac computer, Pavtube HD Video Converter for Mac is the best choice to convert DJI Mavic Pro 4K video to iMovie most compatible video with right video and audio codec. It can compress 4K DJI Mavic pro video to 1080p for iMovie in 60fps/30fps/24fps. It also can just convert DJI Mavic Pro 4K video format keeping 3840x2160 resolution but changing frame rate to 24/25/30p.It has a friendly operative surface. It’s easy for you to convert by clicking few buttons. The software has a default output format for iMovie. You will not worry about which encode MOV should be choosen. You can do some simple editing before using iMovie. 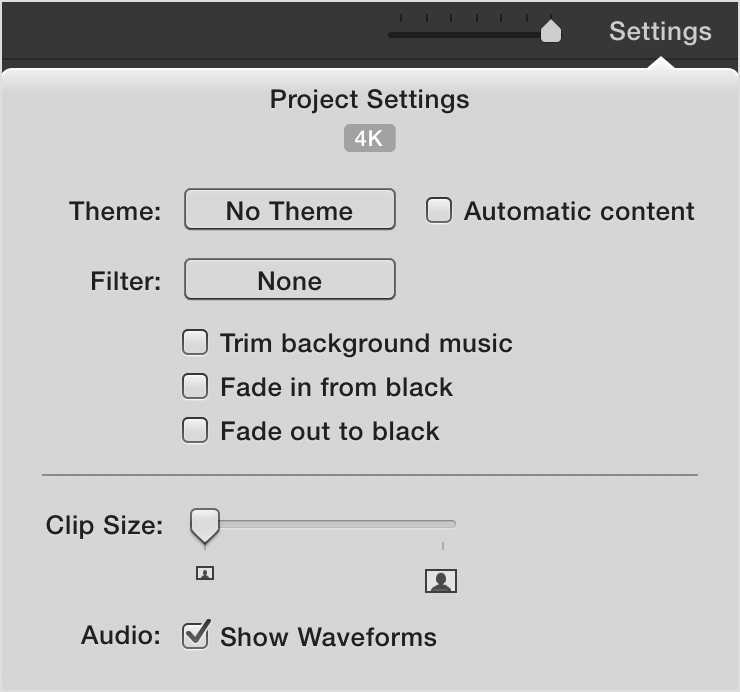 Because the software also has simple editing functions, such as “Crop”, “Effect”, “Audio Editor” and so on. Launch the iMovie Converter and click "Add video" button to locate the .DJI Mavic Pro 4K file(s) you want to add. Check the "Merge into one file" box, you can join several DJI Mavic Pro 4K clips together if necessary. You also can load 4K footage by other 4K recording devices. 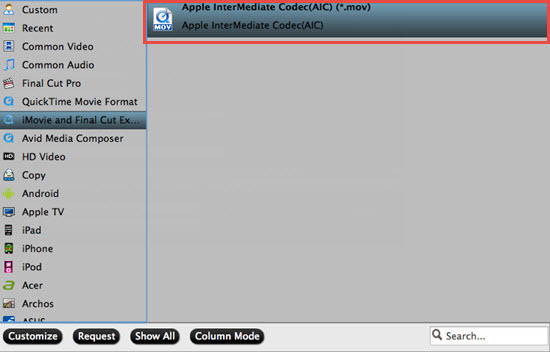 Click "Format" pull down list to select iMovie and Final Cut Express > Apple InterMediate Codec(AIC) (*.mov) as the best video format for iMovie . Click "Convert" button at the bottom right corner to finish endocing DJI Mavic Pro 4K mov/mp4 to AIC .mov for iMovie on Mac OS X. After the conversion, click "Open" to locate the encoded videos and then launch iMovie, choose File > Import > Movies..., to import the converted video into iMovie; prepare for editing. You will find that it's just a piece of cake to edit DJI Mavic Pro 4K files in iMovie.